Is “genocide” a Trademark only for Jews? Benny Ziffer seems to think so! Postmodernism suffered a devastating blow this week... In other words, there’s a limit to how far nations can go in demanding that the world recognize them as victims of a holocaust, along the lines of the Jewish Shoah, without it being clear beyond any doubt that a holocaust of that kind actually occurred and in the same format. This mortal blow sustained by the Armenians, who expected that at the centenary of their national tragedy their historical account, and not that of the Turks, would be recognized has wide implications beyond this specific historical case. It’s a signal to other nations, too, that postmodernism has gone out of fashion, and with it all the widespread inanities that can describe every tragic event in history as a “Shoah.” More specifically, I mean what’s known as the Nakba, which in my view is also no more than a salient product of postmodernism. Perhaps it’s all in our imagination and nothing really happened in 1915 or 1948. Perhaps even last year’s war on Gaza was just a dream. There are still a few responsible adults around who haven’t surrendered to the self-righteous kitsch of national victimization. Postmodernism suffered a devastating blow this week. It turns out that this magic wand — with which, it was thought, historical narratives could be created at the customer’s order — is not living up to the high expectations people have of in it. In other words, there’s a limit to how far nations can go in demanding that the world recognize them as victims of a holocaust, along the lines of the Jewish Shoah, without it being clear beyond any doubt that a holocaust of that kind actually occurred and in the same format. I refer to what’s known as the Armenian holocaust, which in the end did not receive supreme, official recognition as genocide from U.S. President Barack Obama. 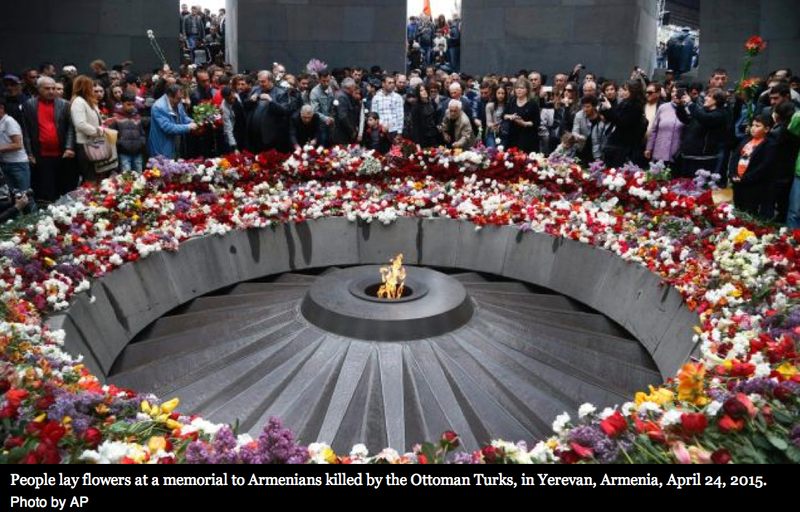 Rumor had it, for all these years, that the blunt refusal of the United States and Israel to accord the Armenian tragedy the appellation of holocaust, or genocide, was due to cynical political interests, such as the fear of an angry response by Turkey. This is one more lie that’s been debunked. Because, if the world operated according to cynical interests, Israel should have leaped at the chance of the Armenian genocide in order to flay Erdogan’s Turkey. What we find, then, despite the many lovers of Armenia in our midst, is that logic and common sense have not yet vanished completely from the world. A modicum of sanity persists, and with it the ability to distinguish between nuances that postmodernism tried to blur. It started with the attempt to blur the difference between Hitler and Stalin, and to claim that both were, when all is said and done, mass murderers. All the other attempts to manipulate history that we’ve endured in recent times derive in large measure from that vast manipulation, from ignoring the small nuances that make the abyssal difference between things. In short, the mortal blow that all the world’s self-righteous types hoped Obama would deliver to Turkey on the centenary of the Armenian tragedy boomeranged on them. And I, from both the personal and family viewpoints, as the son of Jews from Turkey, am especially happy about this. There is no other country — with the possible exception of the United States — that rescued Jews and Judaism as did Turkey, both in the distant past, when it took in the exiles from Spain, and during World War II. It’s true that during the latter period the government imposed anti-Semitic decrees on Jews, but of a negligible character compared to the suffering experienced by their brethren elsewhere. I feel that I am speaking now from the mouth of my late father: He and his family were saved from the Shoah thanks to Turkey, which received them as stateless refugees and afforded them the possibility to earn a living and acquire an education. Whenever the Armenian issue arose, my father would become boiling mad. The last time someone tried to argue with him about the subject, he simply threw him out of the house. In my younger days, I was upset at his one-sided viewpoint, but today I identify with it completely. He told me about the terrible battle of Sarikamish, when acts of sabotage by pro-Russian Armenian militias cut off the Ottoman army’s supply lines to the eastern front. This was at the height of the harsh winter of December 1914 and January 1915. Tens of thousands of Turkish soldiers and civilians froze to death or were cut down then in a hopeless battle against the Russian army, which enjoyed the active aid of Armenian nationalists, who were under the illusion that Greater Armenia would be established with the help of the Allied powers in territories of eastern Turkey. What the Armenians want to see recognized as genocide is the violent Turkish reaction in the wake of that wretched campaign, a response which to this day is perceived by the Turks as part of a battle for their homeland. Two years ago, at the Haifa Film Festival, I saw the Turkish film “The Long Way Home,” directed by Alphan Eseli. It tells the story of what befell some Turkish refugees who survived the devastation of Sarikamish. Along with scenes of horror in which people eat the flesh of other people in that brutal winter, there are magnificent manifestations of humanity and sacrifice. National memories of this kind cannot be erased just because of the relativism of postmodernism. All of the above is meant to convey an optimistic message: that there are still a few responsible adults in this world, including in Israel, who have not surrendered to the self-righteous and convenient kitsch of national victimization and are capable of setting limits to it. In my mind’s eye, I see my father saluting there, above the clouds, to the president of the United States, who this week in large measure spared the enlightened world an unnecessary historical mockery.